Saving energy is on most people’s minds these days, whether it’s at home, at the office or with the multitude of devices and appliances they use. Luckily, that smartphone or tablet can help you develop some great conservation habits by giving you access to useful apps that make living a greener lifestyle easier. Considering a device or appliance that is energy efficient isn't a bad idea either. To save you some time searching through online reviews, check out these top energy-saving devices, appliances and apps you can use every day. A smartphone or tablet’s battery life is constantly a point of contention for many consumers. They want their devices to last for a longer period of time, but they aren’t cutting back on their time spent using them. A good solution that just recently hit the market is the Samsung Galaxy S5 with Ultra Power Saving Mode. This device has a 2800 mAh battery and squeezes an exorbitant amount of energy out of it. When placed in Ultra Power Saving Mode, the Galaxy S5 turns off color and switches to black-and-white mode. It also turns off most connectivity options. Because of this feature, it is possible to extend the smartphone’s battery life by an additional day. Overall, the Galaxy S5 should last through 10 hours of Web browsing and 12 hours of video. Users can also remove the battery and replace with a charged one if necessary. Samsung French Door Refrigerator: Besides delivering fresh water from the refrigerator and making up to 10 pounds of ice a day with its dual ice-maker, this product has high-efficiency LED lighting and a twin cooling system to keep fruits and vegetables fresher longer. Kenmore’s Elite Front-Loading Washing Machine: Designed for shortened washing, this washer saves up to 30 percent on time (also cutting back on energy use), while still doing a quality job. KitchenAid Architect Series Dishwasher: This dishwasher has eco-friendly options including ProWash, ProDry and air-dry. These features allow consumers to use less energy, and the appliance is estimated to use only about $33 worth of electricity per year. 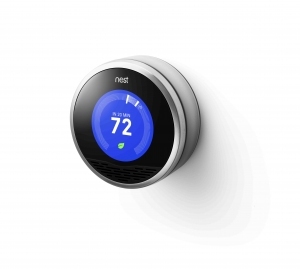 Nest Sense: This personalized thermostat connects with your smartphone or other device to help you save money on energy bills. Besides creating a personalized schedule, users can connect to the thermostat with the Nest App to keep track of their energy use when not at home. My CO2 Carbon Calculator: Track your carbon footprint wherever you go, including while driving your car or commuting on a train. The easy-to-use app helps users track their total emissions and then set goals to reduce their environmental impact. Light Bulb Finder: With incandescent light bulbs becoming a thing of past, you can use this app to find the right fit, style and light quality of energy-saving equivalents. EnergyUFO: Used alongside the UFO Power Center, users can manage the energy use of their home appliances, eliminating stand-by power and saving electricity. You can automatically turn off appliances, start them at off-peak times and do it all via Wi-Fi. Energy Cost Calculator: This app helps users calculate operating costs and energy usage of electric equipment and machinery, including carbon emissions. Whether you want to make the switch to an energy-efficient appliance, or simply use an app to monitor your energy consumption, every little bit helps. These are just a few of the many energy-efficient devices and apps for everyday use.